in70mm.com editor awarded Honorary Membership of the BKSTS for the work in preserving the history of 70mm and for keeping it alive in arranging screenings. The award was presented at the Odeon Leicester Square in London. Since summer 2009, David Strohmaier, and John Sittig have spent considerable time to find the best elements of "Windjammer" for DVD and Blu-ray release. Bob passed away this morning and we intend to comply with will as to what should happen next. We will have a Memorial Service for Bob where he requested that humorous eulogies should be spoken by those who knew him. The latest "state-of-the-art" cinema of Europe was opened on the 14th March 1957, a few minutes away from the Hamburger central railway station at Steindamm 54. Am 25. Okt. 2009 fand in der Astor Film Lounge Berlin eine 70mm-Gala-Matinee des MGM-Films "In den Schuhen des Fischers" anlässlich des 25. Todestages des Schauspielergenius OSKAR WERNER statt. During the 1950s and 60s, less than 100 films were made in 65mm. Still, those titles have acquired such an aura of mystique, like the royalty of cinema, that fans are flying in from around the world to see them. "The Golden Head" is actually not that bad a film. It's in the tradition of films made by various European countries going back to the Twenties aimed at the "tween" audience, usually lighthearted mysteries with kids solving crimes. "The Last Valley", Austrian 70mm Premiere. The film will be screened in Innsbruck on 24th and 27th September 2009 for its 40th anniversary of shooting – first time in Austria in it’s original 70mm-version. During the trip across the USA, Chruschev has visited Circarama and has been admired by it. On arrival home, the secretary general has desired "to catch up and overtake" America and for three (3!) month we has been constructed Circular panorama! The current state of Cinerama in the U.S. I did experience my first breakdown with "TIC". The Vienna Boys Choir suddenly began slowing down, then stopped altogether, then the A, B, and C projectors snapped off in turn. After about three minutes everything restarted in sync. 3-Strip at the Dome - and 70mm too! I was invited up to the projection booth for the Cinerama pre-screening setup and spent most of my time there during the 3-panel shows. These earlier lenses were all engraved as having a power of 1.33X but were never used having that power. We started designing these lenses with the power of 1.33X and had to alter the power but didn’t change the engraving. Who is David Coles? At the impressionable age of 12 my mother took me to the Sydney Plaza Theatre to see “Seven Wonders of the World” and I immediately became a Cinerama addict - determined to find out all about this wondrous process. Cinema Retro issue #15 is now shipping in Europe. We anticipate it will arrive in the USA by mid September and will then ship to all other parts of the world. All 70mm films in territory of the USSR were distributed by huge amount of copies. These films went not only in Moscow, and on all USSR, including Soviet Republics such as Ukraine, Belarus, Baltic Countries, Moldova and others. I have an appointment with Nellie and she is still as gorgeous as when I first met her 49 years ago, dancing on the beach, in love with a wonderful format. "Das Grindel" nannten die Hamburger einst liebevoll das Grindel Filmtheater, das am 25.11.1959 seine Pforten öffnete. Der Eröffnungsfilm war damals der Film "Im Zeichen Roms" in Eastmancolor und Dyaliscope mit Anita Ekberg. 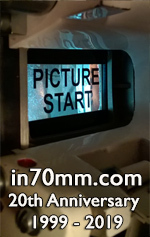 A new exciting publication is coming soon from from "International 70mm Publishers", edited and published by Johan Wolthuis in The Netherlands. The book examines the question: "Are there any chances for the future of original 65mm filming and 70mm presentation?" Two DP70 (892+896) from Odeon, Hanley in October 1964. Ran "South Pacific" from 22.09.1958. Renamed Queens Cinerama Theatre from October 1964. 3-strip Cinerama 1963-1978. 70mm Alive and kicking in Berlin! I have received the attached photos of the Gaumont cinema in Manchester. Well, after all my years of searching I cannot believe that someone actually had these photos. Digital Cinerama! D150, CinemaScope 55, Ultra Panavision and much much more! A new 65mm mirror reflex film camera will be released in Feb 2010. It's main use is to support 3D filmmaking but can be used for standard flat screen 5/65 shooting. 70mm: "3-D without glasses", or "The Showmanship Format"
The Workshop has devised a contemporary logo to support The Premiere Experience branding concept. In 2000, I had the pleasure to interview Ken Annakin in Bradford about his work with large format film. I just learned yesterday that he passed away this week, age 94. The problem was the building was to be used one last time for a charity art exhibit and the artist were given the film to use. They had planned to spray paint the reels of film with florescent color for a large mobile to hang from the ceiling. 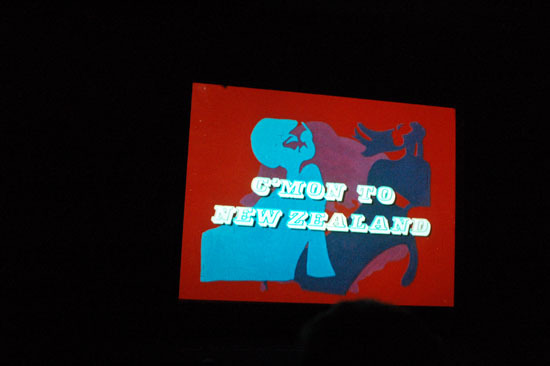 "This is New Zealand"
The Restoration of "The Alamo"
The 2nd 70mm Film Festival in Copenhagen runs from 26 - 30. April 2009. Come and see "Poltergeist", "Fame", The Abyss", "Titanic", "Out of Africa", Patton" and "Hello, Dolly!" in the LARGEST cinema in northern Europe. 70mm presentation raises specific staffing and training issues that need to be fully and effectively addressed before taking on the format. For 30 years Filmhouse has been *Edinburgh's best independent cinema*, showing over 500 incredible films each year. Filmhouse *celebrates world cinema* in all its brilliance and diversity. Our friends at 20th Century Fox have promised us a NEW Dimension 150 print of "The Bible...in the Beginning". Come and see it, at the 14th Widescreen Weekend in Bradford, England. Our inaugural special edition will be dedicated to a film that is among the most requested our by readers. MGM’s "Where Eagles Dare" is one of the most enjoyable movies of 1960s. The most ambitious 70mm festival to date. Background about the festival, reviews and festival images. April 2009. Again the audience in the Czech Republic can experience the unique quality of the 70mm format.